Dogs and horses have been my passion since I was a child. I wanted to pet every dog that I saw from my stroller, I only played with dog and horse stuffed animals, and my favorite books were ones about dogs or horses. I was destined to work with animals. While growing up in Fairfax, VA, I started riding horses in kindergarten, and rescued my first dog when I was 11. Clancy was a beautiful Dalmatian and he was the first dog I trained. I taught him a routine of tricks and we would perform them for all of the other children in the neighborhood. After college, while living in NYC, I fostered an English Pointer/Pitbull mix named Kobie. He was on death row at a local shelter because of the overcrowding conditions. I swooped in there and got him out, taught him basic obedience and then adopted him out to a wonderful family in New Jersey. A few months later, while engaged (to my now husband, Danny) we adopted a 9 month old Weimaraner/Chocolate Labrador mix named Breck from a shelter in Pennsylvania. Due to neglect as a puppy, Breck suffered from severe separation anxiety and had a laundry list of other issues when we adopted him. Now 4 years later Breck’s wonderful behavior and calm demeanor make people doubt that he was ever a dog with “issues.” He is relaxed, attentive, extremely loyal and his big green eyes can melt anyone’s heart. Our favorite activities are playing in the local dog parks, hiking, swimming, eating at the local restaurants and of course shopping! Breck loves all of the attention he gets during a shopping trip to his favorite store, Bloomingdales! He is my trusty training assistant (and usually the better trainer between the two of us!). Danny, Breck, and I recently made the move from NYC back to the DC Metro area (we now live in Arlington, VA) and we couldn’t be happier to be back! I am an Animal Behavior College certified dog trainer, a member of the Association of Pet Dog Trainers and a member of the International Association of Canine Professionals. I completed my undergraduate degree at Syracuse University with a major in psychology. 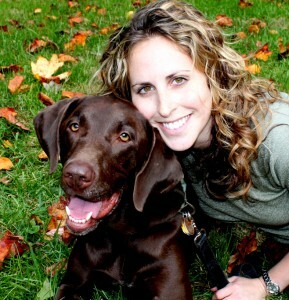 After working five years in corporate America, I decided it was time to pursue my passion for working with dogs and started Pawfect Pups in the fall of 2011.